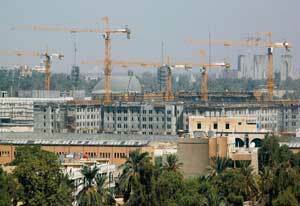 A contract worth $7.75 billion is set to be awarded to a South Korean Hanwha Group tasked to construct 100,000 homes in the suburbs of Iraq’s capital, six miles southeast of Baghdad. Reports from AFP and yahoo.com said this so far the biggest overseas contract to be undertaken by a Seoul-based company. Iraq’s investment commission is set to sign the final agreement for the so-called Besmaya re-development project with Hanwha Group to be represented by chairman Kim Seung-Youn, a company spokesperson told AFP. Part of the contract is for Hanwha to build infrastructure projects such as roads, sewerage, and water supply for the Besmaya housing project set for completion in 7 years.